You can give to Grace Missions by shopping on Amazon through their charitable contributions program AmazonSmile. Amazon will donate 0.5% of the price of your eligible AmazonSmile purchases to Grace Missions, Barnesville, GA. AmazonSmile is the same Amazon you already know: Same products, same prices, same service. 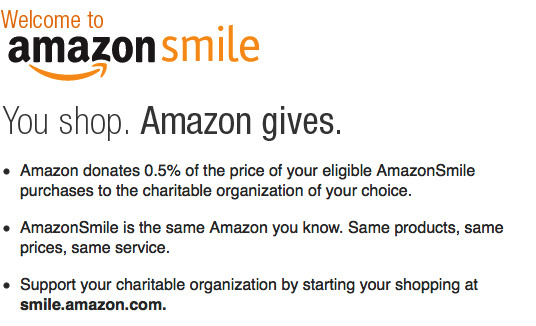 If you shop only through smile.amazon.com using an internet browser on your desktop or laptop computer, your mobile phone, or your tablet (including any Kindle Fire device), your purchases will be eligible for donations. Purchases using an Amazon Shopping App or any Kindle E-reader through the Kindle Store are NOT eligible for donations. Click on the following link http://smile.amazon.com/ch/46-0881930. Enter Grace Missions, Barnesville, GA as your preferred charity. (You must use “Barnesville, GA” as part of our name since there are many “Grace” charities.) Hit ENTER and you are all set to go shopping. When you use smile.amazon.com on all your orders, you will see a notice stating “Supporting Grace Missions” at the top of your screen. Everything else on the screen will be the same as usual: prices, wish lists, registries, etc. with the added benefit that the AmazonSmile Foundation will donate 0.5% of the purchase price to Grace Missions. Thank you for shopping smile.amazon.com and helping Grace Missions at the same time!